2// Loving how the new set looks on our deck! Now I'm on the hunt for an affordable rug to go under it all...any ideas? 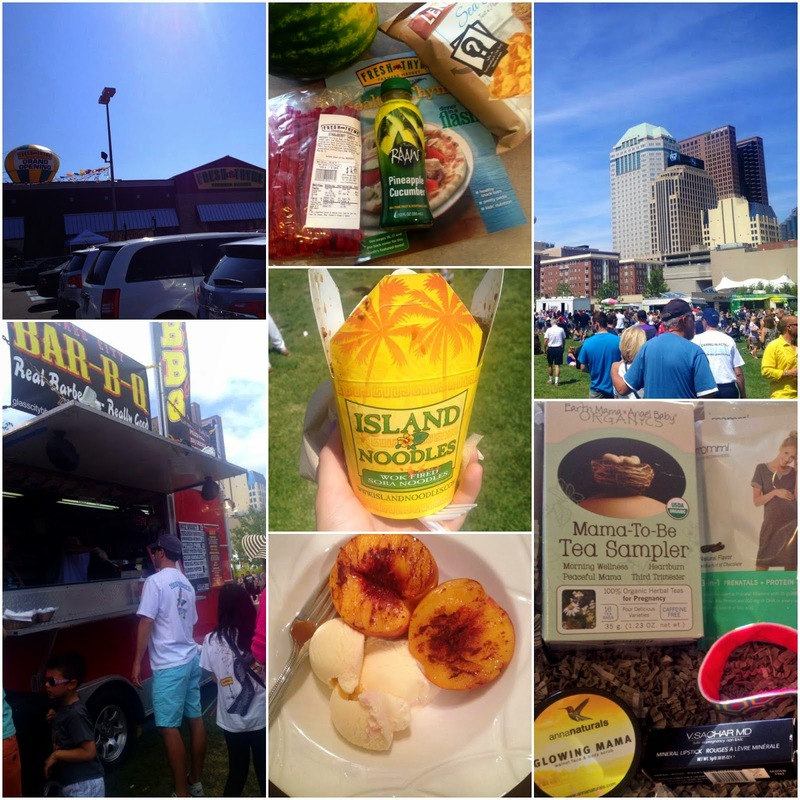 4// Columbus also had their annual Food Truck Festival this past weekend. It's a two day event that features over 40 of the best Food Trucks in Ohio. We went Saturday afternoon for lunch since it was beautiful out and I got these amazing soba noodles and Billy got BBQ. No surprise there-the man loves his BBQ! 5// Friday I set out to do a big maternity shopping trip that ended up being everything but. I bought this sweater (will be perfect for the fall/winter with leggings), a pair of skinny jeans, and a pair of black pants for work but that's it. I had high hopes to find all kinds of essentials that I could wear for the next few months and as it turned out I couldn't find hardly anything in my size or things that I even liked. Why are maternity sections so small and why are good things so hard to come by?! Let's just say I can't wait until the weather cools down and I can wear leggings a lot...excited about that! 6// Kristin sent me the sweetest gift in the mail and included a monthly box from Baby Bump Bundle. It's the same concept as the other monthly subscription boxes, but for moms-to-be and even new mothers! I loved all of my items in the box and have already used them! My favorite being this Glowing Mama scrub. 7// Two words: grilled peaches. The best. Just cut them in half...brush with olive oil...sprinkle cinnamon on top...place on grill. Then of course top with vanilla ice cream. YUM! 8// Really lusting after this adorable sweater for fall (love this color too), but not sure if it'll work with this bump of mine. Obsessed. 9// I can see Camden kicking from the outside now! I've only seen it twice so far and the movements are still pretty quick and fast, but it's so exciting and cool. I've been noticing more and more movements this past week and can't wait for more little baby kicks and jabs to come. 10// Speaking of our little boy, his crib is being ordered this week and we are hoping to pick up the dresser this weekend! Yay for progress! 11// If you like baby moccs or have a pregnant friend/mommy friend who does...come back tomorrow for a big giveaway that I'm really excited to share with you all!! How was your weekend? See you tomorrow! LOVE the new patio set!!! Looks so great on the deck! That sweater/sweatshirt looks so cozy!!! Went to the food truck fest too! Almost went with the noodles but had the grilled artichokes by the Sweet Carrot truck...so good!! I didn't know that Fresh Thyme opened, I'll have to check that out! Thanks for the info!! 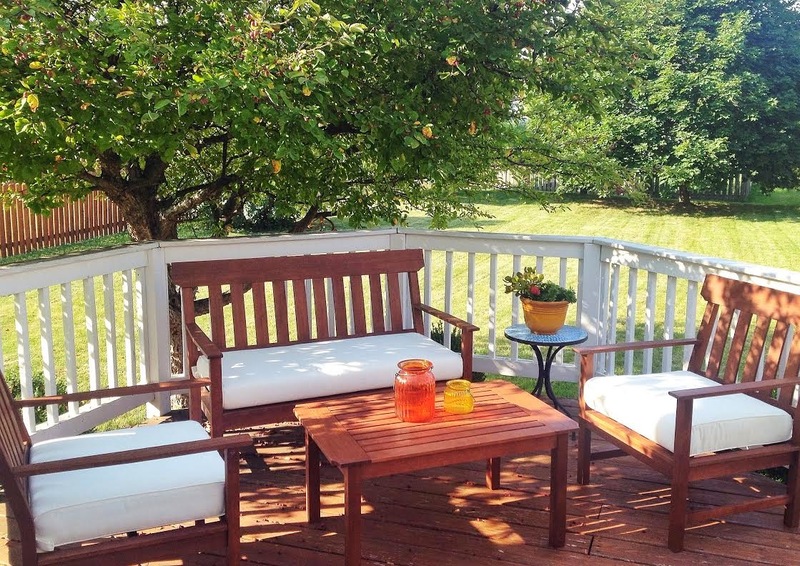 Love your patio set! Wish it wasn't so hot so we could enjoy ours here in Charleston! 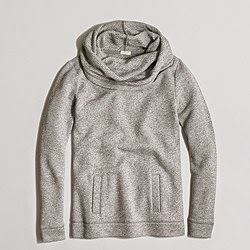 I have my eye on that J Crew sweater too, it looks SO comfy! I can't wait to feel some movement from our little one, it must be the best feeling! We have been living off grilled peaches this summer...omg so good and somewhat healthy dessert. We have been topping them with cool whip, honey and cinnamon. Delicious! I love your patio!!! I so wanted to go to the Food Truck Festival this year but we had way too much going on, hopefully we can make it next year. It is just going to have to be one of those things that we put on the schedule and have to go to!!! I cannot wait to see little guy's nursery, no doubts it will be super adorable!!! Overstocks is my go-to for reasonably priced rugs. Also shipping is only $2.95 so you can't beat it! I was so excited to buy maternity clothes and then I could never find much either. Honestly I think from all your style posts I've seen you'll be fine, the cutest maternity outfits I think are the ones with maternity tops only and then you can just throw your normal blazers/jackets/cardigans over top with a belt and accessories and it looks super adorable. I'm heading into fall with a giant bump and I can't wait to put leggings on!! Oh and I bought skinny dark jeans from Old Navy for like 30 bucks and they have been great! Their tops and dresses don't wash that great but jeans are good! Love everything you purchased this weekend and grilled peaches are the best! I love your outdoor furniture! Now I want to go buy that set and get rid of ours! and that Sweatshirt is super cute! So happy to hear you loved your bundle from Baby Bump Bundle and got pampered by your blogging buddy at Mama and Mou Kristin :) Congrats on your bundle of joy on the way and enjoy your new goodies!